2:44 I'm done for the day. Thanks for coming. See you next week. Take a course. 12:39 updated my first FOP chart in the CCT Room. 12:26 aborted my fractal trade for 0. Didn't like trading flat. 12:04 I'm finding "All About High Frequency Trading" by Michael Durbing fascinating. Explains where the big boys focus. Happy to know they do not focus on the 4 to 10 trading hour fractal I do. But they do fuel the streaks in the fractals. 11:08 I've found another fractal, which I have pasted in the Certified Chaos Trader's Room. 10:21 fractal patterns get their name from the word fracture. They are not continuous, nor do they necessarily connect end to end. A new event, espeically one that creates a big vertical bar, like today's report, can begin a new fractal. 10:17 EXMA's are not the only tool I use. My primary tools are my eMylar pattern overlays, like the Fracatl of Pi, Face of God, Fractal Grid, etc. 9:46 whacked for -4. Happens. I was too anxious to make a trade. 9:12 pretty flat - this could be an MM stinker day. 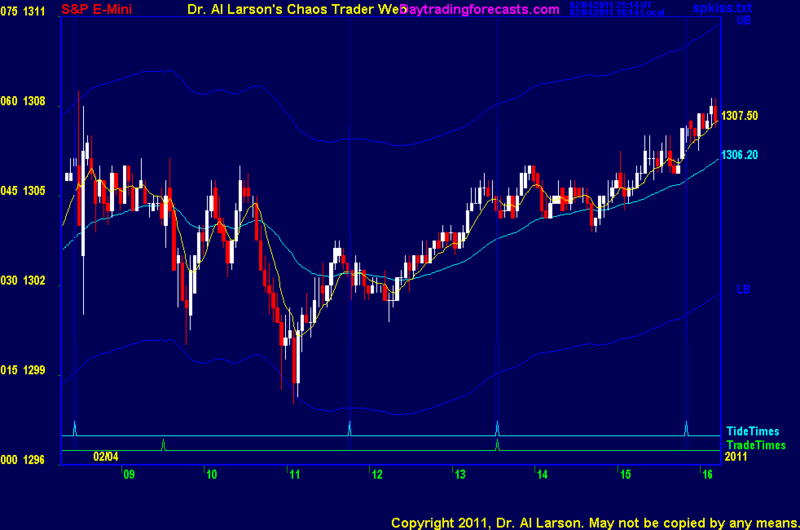 2/4/2011 10:19:58 AM MT Al****:: Ahab, use the Add a Certified Chaos Trader comment link under the first chart. 2/4/2011 10:08:35 AM MT Ahab****:: I would like to post a comment in CCT room but cant get into it. I can open everything else. 2/4/2011 10:01:45 AM MT Al****:: Thanks. This too shall pass. 2/4/2011 9:51:51 AM MT ken:: Hi Al, stopped in last week...found out you'd had a couple of minor setbacks...glad to see your back (no pun intended)..... is feeling better, as well as the leg..
2/4/2011 9:15:44 AM MT TG****:: Al, I can only see the bottom two boxes in the CCT room. Been like that for past few weeks. Anyone else experiencing the same. 2/4/2011 8:32:39 AM MT RAH:: My CC trade went south too, really wierd fit unfolding! 2/4/2011 7:43:09 AM MT mm****:: looks like Al's lucky day ! 2/4/2011 7:18:30 AM MT RAH:: Hi all.... good luck today. Short day for me. 2/4/2011 6:58:15 AM MT EOE:: GM everyone. 5F this morning sun is out and shining brightly. good luck.